Year One students will also be given a serve of Weet-Bix, the Prime Minister announced yesterday while launching the free milk programme at the Nakelo District School. He thanked the CJ Patel Group of Companies and Fiji Dairy Limited who generously provided the Year One students with their own Weet-Bix bowl and spoon. “I wish to thank the CJ Patel Group of Companies and Fiji Dairy Limited who have partnered with my Government for all the hard work it has put in to deliver this massive logistic undertaking and have gone the extra mile to ensure that all Class One students receive a healthy meal every morning,” the Prime Minister said. He paid tribute to the late managing director of CJ Patel, Sundip Patel, for passionately sharing and giving meaning to this vision. 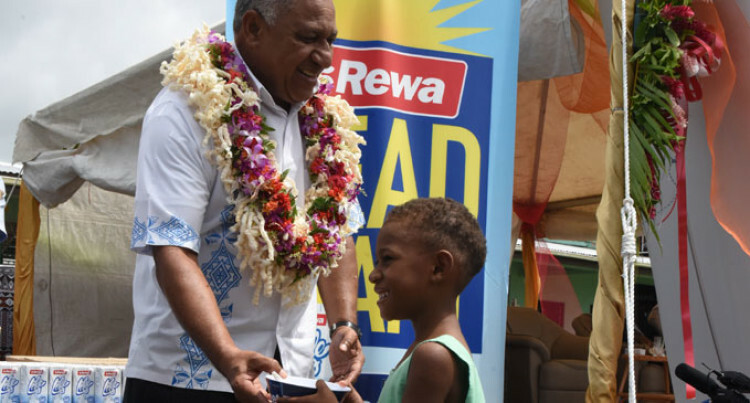 The programme, valued at $420,000, will be providing free Weet-Bix toYear One students along with the free 250 millilitres of milk per day to schools nationwide. The programme is also supported by Sanitarium Australia. CJ Patel Group and Fiji Dairy Marketing Director Nathan Hildebrand said seeing Government’s commitment to Fiji’s future inspired them to do more. “All the milk that is being supplied and logistics and distribution is being done at no extra cost but we still felt that we could also further contribute to this great cause,” Mr Hildebrand said. The programme also includes teaching aids and support materials for teachers. According to the Prime Minister, one Weet-Bix and a 250 millilitre packet of milk every school day was a tremendous boost to the health and well-being of our Year One students. He said it had taken time to get the programme off the ground because they were determined- both Government and the company- to ensure that the milk reached schools around the country all at the same time. He gave his assurance that by delivering the milk in this way, it did not matter if they lived in a city or town or in the remotest rural or maritime community. He urged the children to enjoy their milk and Weet-Bix because it would give them a wonderful start to the day and in life.